Still ugly just not as bright... will get new lights one day. Marc and I made a plan to only spend cash. No charging for us. So thats where the painted cabinets came from. Make due till you get the cash. I dreamed over all of those fancy kitchens with the pretty things. I bought two of these and added them. I think they are called corbels..Not sure of the spelling. Boy did they make a difference! 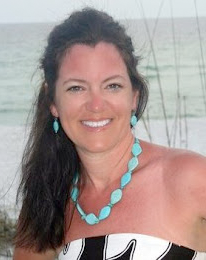 I want to add a few more details like this... Just a few more tassel sales away, smile! I know how much knobs cost because I paid a pretty penny just a year ago on new knobs for this same room. They were silver and just didnt work for this new look. Anyone want to buy some very nice , heavy knobs... just let me know. I LOOOVVE this kitchen! 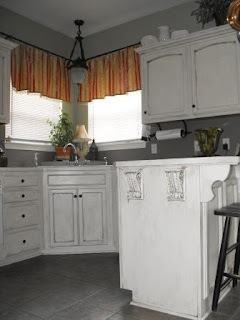 You did a fabulous job on those cabinets, and the corbels add a wonderful architechtural touch! Wanna come work on my kitchen?! Haha! First let me say that I hope your kiddo gets better soon. I HATE when I can't make mine feel better! LOVE the cabinets! Love, love LOVE them! I am now seriously considering the same thing. You did a fantabulous job. I'm glad to hear your son doesn't have anything TOO serious! I think your cabinets are fabulous! My cabinets are now white but I'm kind of thinking they need a little of the "Susie" touch. This is so beautiful! I did the same thing to my ugly flourescent light box. 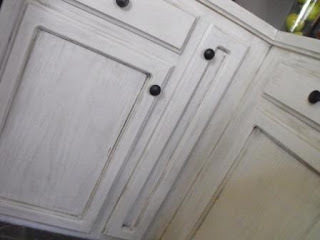 I am going to glaze the white that I painted it to give it character (a girl can hope, can't she) If you ever want to make glass front cabinets we did the ones over the bar in our Florida home. My husband cut out the door part inside the raised panel and we had a piece of glass cut to fit the opening. It was around $5 a door. It looks so good and I bet you find yourself going to stand and look at it. Oh come on, I know I am not the only one! You did a great job on the kitchen! It looks like a new place! I love the cabinets! You did a great job, it is so much brighter. I sure hope your son is feeling better very soon, it is so sad when our babies are sick, no matter how old they are! Nice job on your kitchen. Wow, you did it so fast. I've been lurking for awhile and really enjoy your blog. I love the new look! I am about to undertake a similar project so your transformation is wonderful to see. BEAUTIFUL!! Would love to know the paint color on the walls, I am working on a office and LOVE the color! 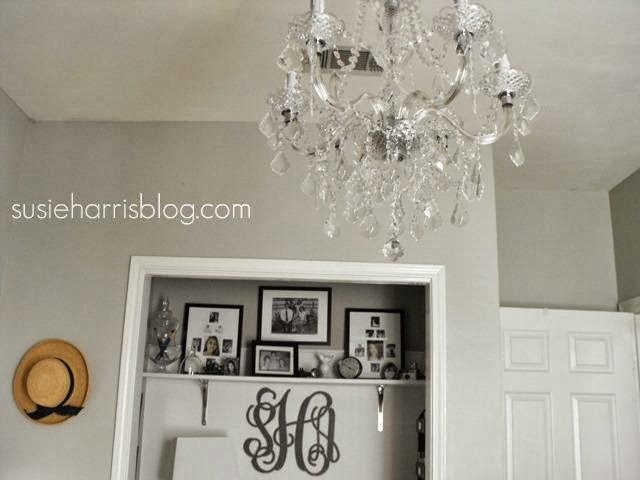 Susie it looks fantastic...and I love the corbels! Can you post the steps you took to do that? Pretty please! Oops, I just scrolled down and saw all your instructions. That sanding scares me. And did you paint the inside of the cabinets? Susie, it looks fantastic! I know you are in love with it. 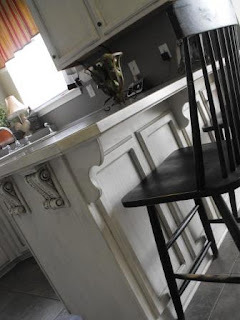 I menioned I did a kitchen redo 6 years ago & I was in love with my kitchen too. In fact, I'm gonna do a post on it next week, I think. There's a lot of work that goes into one of these, so I know how hard it was to paint & glaze. I would highly recommend painting that old oak to anyone. You just can't beat the lighter look. 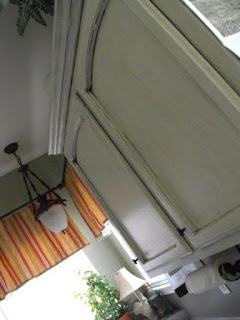 I added corbels when I did my old kitchen too & it's a world of difference. Good for you on paying cash as you go! That's the only way to do it. I absolutely love it. It came out so well. Hi guys... The paint color is svelte sage. It's been in my kitchen for about 5 years and I still love it! No I didnt paint the inside of my cabinets. Just too lazy, smile! As for the corbels we glued them on. Easy as pie! Oh, it's beautiful! I just posted about my kitchen re-do today too! 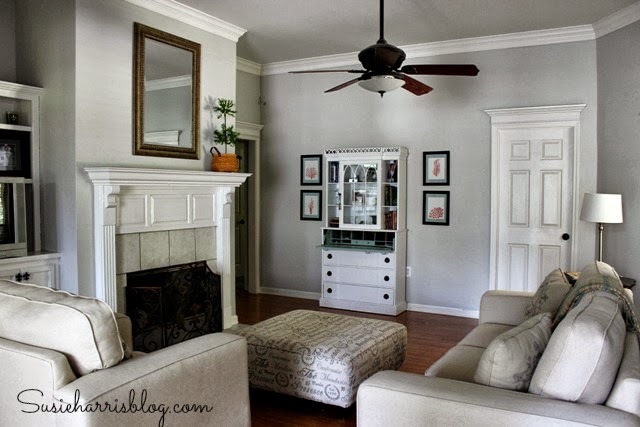 I like the corbels--what a great touch! I love the kitchen great job! Your kitchen is gorgeous Susie! So good to hear your son is going to be fine! Your kitchen looks great!!!! I can't believe how good it looks!!! I can't wait to get the paint out. I hope Jesse feels better soon and I will be praying for his test to come back good. The corbels add so much. You did a great job on the cabinets. It all looks beautiful! How great to know that you didn't go into debt with the remodel too! LLLOOOOOVVVEEE it!!! It is so gorgeous! You did such a great job! I got my tassel today and LOVE it!! I'll post about it soon! that looks really great! I wish I had the guts to do that! Great job on the cabinets. I know what you mean about only using cash that is the way to go. Our big upcoming remodeling project starts tomorrow... a new roof, not the most fun project but totally necessary. Glad that boy is on the mend. Have a great weekend! I love the makeover!! I don't think I would want to change cabinets after that. 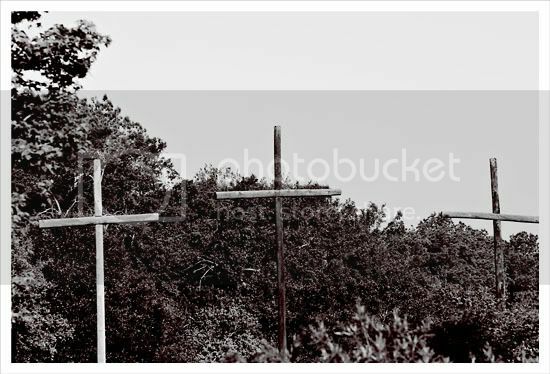 Its amazing how a little paint can work such wonders!! Your cabinets are so beautiful! The corbels added such beautiful detail! Love it! I'll stop and say a prayer for your big boy now. I hope he's feeling better soon. You did such a fantastic job. I want to be you when my kids are all in school and I can DO things! You are so talented Susie, you really are! You and your kitchen are wonderful!!! I can't believe you finished the job so quickly. It took me forever to paint my cabinets. By the time I did the cleaning, sanding, cleaning, priming, painting, glazing, and two coats of poly, I was SICK of touching those cabinets! Oh, that looks beautiful. I want to do my kitchen like that. Did you get new countertops? Oh.... new counter tops... In my sweet dreams... Maybe one day. Thanks for asking Amber... Do my ole ones look new? Oh I hope they do! Your kitchen makeover is gorgeous. I love the way your cabinets look. Seriously, how long did this take you? One of my friends did hers and it took her months to get it all done. But, she took all the cabinets off, etc. I just hate the thought of getting started and then having it drag on and on. Thank you so much for sharing your wonderful talent with us! What a great transformation. Your hard work has paid off. Great redo! Just love it! Susie, love the kitchen cabinets and those knobs really look great. Glad to hear about your son not having strep, what a relief. Love how the cabinets look. We need to have a Tassel Bonanza sale so we can see you complete your beautiful kitchen! 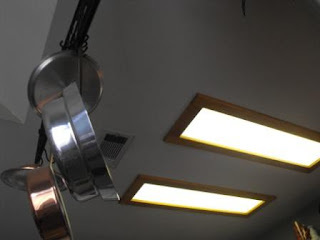 Wow--what a beautiful job you did on your kitchen! White or creamy-toned kitchens are my favorite--they are so clean and fresh, yet calming at the same time. I did a similar look with my new kitchen! Fabulous! That turned out so great!!!! Thanks for the inspiration! Susie, Your kitchen look amazing! It looks like an expensive custom do! You did a great job! :) How did you attach the corbels? Hope your son is feeling better! How on earth did you do that so fast? It looks fantastic. Great job! I love how it looks with the paint color. And, because I'm me, I love love love your accessories on the counters. The kitchen looks wonderful, you must be pinching yourself every time you walk in there. It's a dream come true. The crown tassel got here today and I LOVE it. It's more beautiful than the picture so I had to blog about it. 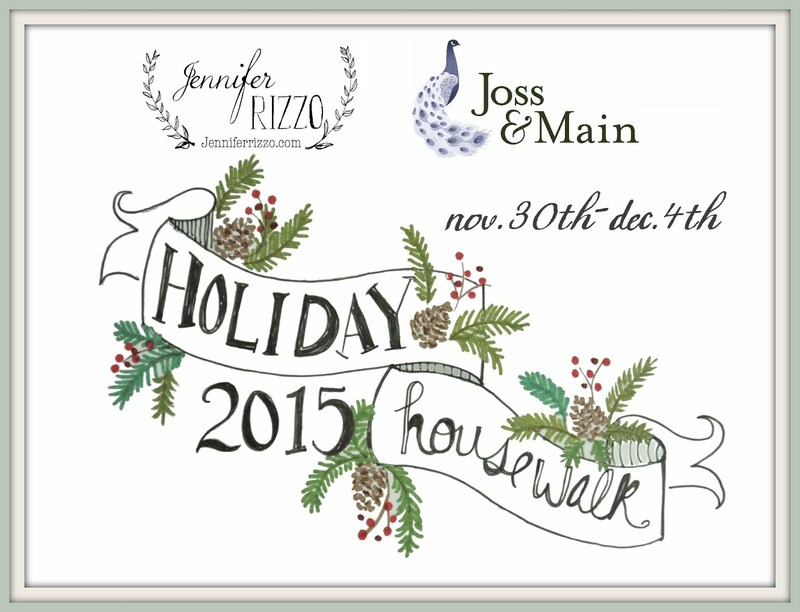 Thank you for the visiting our blog and answering my question about the paint color. Hope your son feels better. Hi Susie! Wow! I am LOVING the new kitchen look! It's very similar to what I've been wanting to try. I'm so inspired now! I got my crown tassel and it's so gorgeous! I'd like to show it off on my blog. Is that okay? Susie, I just adore your kitchen. What a difference the white cabinets make and those corbells - they look so elegant!! We've been trying to do remodeling and some updating and are taking the same road as you - cash! It feels so much better knowing you don't "owe" for things. Again, love your kitchen. Oh, just to ask - how long did it take to paint all these cabinets? Great makeover! 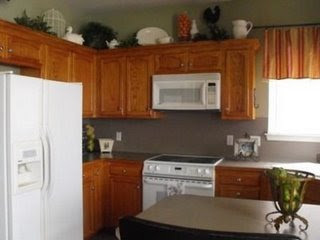 Your kitchen cabinets look great. 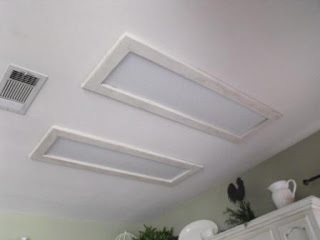 You did beautiful job on those cabinets - will you fly up to Connecticut and do mine with me? Didn't even notice the stove untill you pointed it out. Love the little decorative things corbels or what ever they are called. 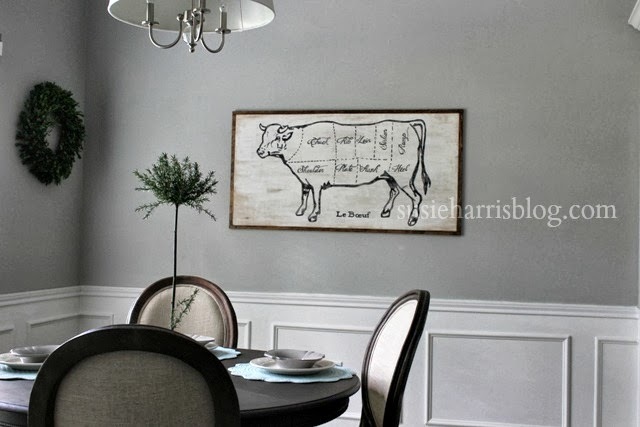 How cool of you to save some money and be frugal about decorating. I really admire that! I think the cabinets are fab!! Oh, me again, love the new light boxes a ton!!! Your new kitchen looks great! 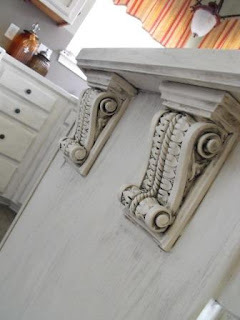 I love the fresh cabinets and knobs, and the corbels add just the right touch. Wow! You have been working your tail off, Susie! Your kitchen looks completely transformed. I'm impressed. 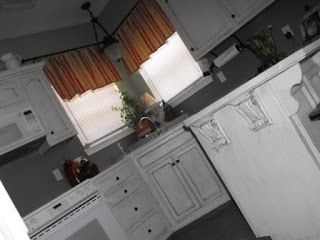 I really enjoyed seeing your kitchen redo...I am planning on painting my cabinets and love to see how beautiful yours turned out....inspires me! Thank you! Great job on teh cabinets. What technique (sp?) did you use to get that washed effect? Was it hard? 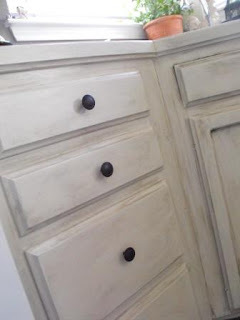 When I told my dad thaty I wanted to paint my cabinets, he said.. don't do it- the paint will chip! So... I wasn't brave enough to do it. Is there anything special you did to your cabinets to prevent chipping? I just found your blog and love it! I've spent some time today going back and reading. When I stumbled upon this entry, I had to comment. Your cabinets are beautiful!!!!! I love, love, love them!!! Do you mind sharing how you did them? This is just what I have been looking to do with mine.